As leaders in our respective industries of networking and computing, we worked closely with Intel to develop the Archer C2700, which is the first in a portfolio of TP-Link® routers that will use Intel® technology. “With the C2700, we utilized Intel technology to make your WiFi more stable, so mom can watch Netflix, dad can stream music, your teenager can video chat, and your youngest can play online video games without any drop in performance for anyone.” said Louis Liu, CEO of TP-Link USA. One of the key things that sets the Archer C2700 apart is the Intel® Home Wi-Fi Chipset that helps deliver consistent and powerful signal strength to multiple devices at the same time. 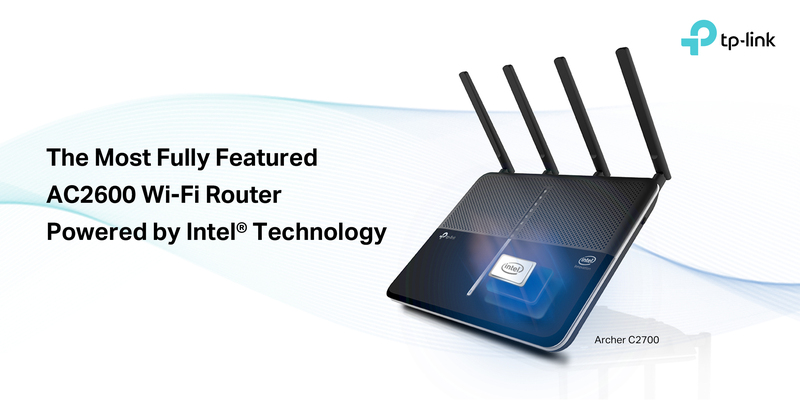 With the powerful connectivity enabled by Intel technology on the inside, and the far-reaching range of TP-Link antennas on the outside, the C2700 is the perfect router for the modern family with multiple devices. For more information, check out our product page here. The Archer C27000 router will be available in late Q4 at the everyday price of $169.99 USD. The Archer C2700 will be a part of the Amazon Smart Life Roadshow. Check it out on Instagram. * Maximum wireless transmission rates are the physical rates derived from IEEE Standard 802.11 specifications. Range and coverage claims are based upon test results under normal usage conditions. Actual wireless transmission rate and wireless coverage are not guaranteed and will vary as a result of 1) environmental factors, including building materials, physical objects and obstacles, 2) network conditions, including local interference, volume and density of traffic, product location, network complexity, and network overhead and 3) client limitations, including rated performance, location, connection quality, and client condition. Intel and AnyWAN are trademarks of Intel Corporation in the U.S. and/or other countries. or the TP-Link Forum at http://forum.tp-link.com. You can also follow Intel on their Facebook, Twitter, Youtube, Linkedin or on their website.